If you weren’t already aware, basically anything can be pickled and we have totally hopped aboard the pickling train. We’ve made our own traditional pickles (…and then we fried them), but today we wanted to tell you about making pickled zucchini. In the summer months, zucchini is in abundance and we like to find new ways to cook with it, other than just continually roasting or steaming it; by pickling it, we get a totally new and delicious way to enjoy them! 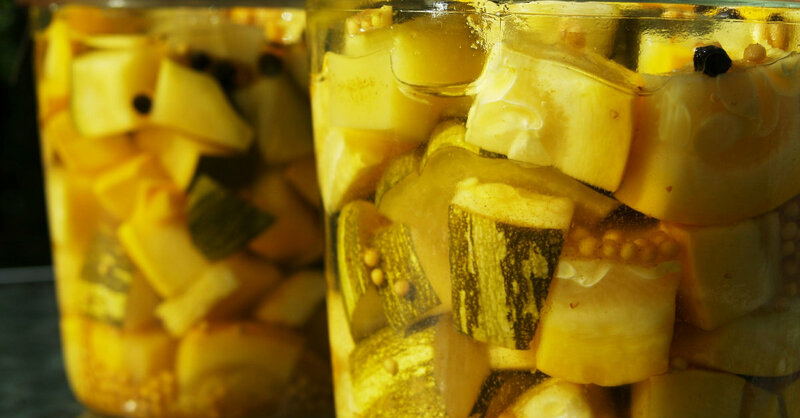 Also referred to as “refrigerator pickles,” because they come together so quickly, these zucchini pickles are super tasty and perfect for noshing on throughout the day. Make a big batch and check ‘em out for yourself! In a colander set over a mixing bowl, toss chopped zucchini and shallots with 2 tablespoons sea salt and place in refrigerator. Stirring occasionally, let chill for 3-4 hours, or until vegetables have drained. Note: if excess moisture remains, pat zucchini dry with paper towels. In a medium saucepan over medium heat, combine 1/2 cup water with vinegars, sugar, remaining salt, mustard seeds, mustard powder, peppercorns and turmeric. Bring mixture to a boil, stirring so sugar dissolves, and cook for 3-4 minutes. Then remove from heat and let cool. Place zucchini in an air-tight, glass container and pour enough brine over the vegetables that they’re covered by at least 1/2 inch. Seal glass jar and store in fridge. Note: zucchini is ready after 24 hours and can be stored for up to 2 months. Check to make sure vegetables are always covered by liquid.